Like all of our work the Wall Vines come with removable flowers allowing for complete customization. Below find our most popular color combinations. Please select your favorite color combination to be displayed on your Wall Vine then simply add to cart. Your Wall Vine will be shipped with the stem color and color combination of your choice. Rainbow runs neck and neck with Prism for the top selling position. Flowers are bright and happy and rainbow catches the essence of a fresh flower bouquet with the bright primary colors. No matter the decor in the room this piece will fit anywhere when you add a bright splash of color like the rainbow color does. Colors: red, orange, yellow, moss, blue. Choose you base configuration below for your new Rainbow Bouquet. Similar to rainbow but the Prism color combo has all transparent glass. Prism has a very unique look as it changes considerably based upon the light in the room and surroundings. This has been the best selling color combination since 2003 and for good reason, it is just beautiful. Flower colors are trans blue, trans green, trans turquoise, trans red, trans orange, trans purple and trans yellow. select the base configuration below and get your prism sculpture now. Surprise got its name after being consistently one of the top selling color combinations. Red, sunrise, yellow, teal and purple create a perfect blend of bright strong colors and fit nicely with most any decor. Select the base configuration to suite your needs from the list below. Pastel says it all using baby blue, lime, sunrise pink and banana glass to create a very comfortable color combination that makes the perfect gift for someone who you want to think of you with and smile each time they do. Choose you base combination below. This one reminds us of a colorful day at the beach with the bright swimsuits and beach umbrellas line the shoreline. Something about the pink, lime, banana, turquoise and orange combination of colors that brings a smile to your face and lightens up your day. Select the best fitting base configuration below for your new Beach Color Combo. Fall is perhaps the most amazing season of the year with the transformation of the leaves and the beauty it creates can be magical. This piece captures the feeling of that time of the year and vibrantly displays it in your home throughout the rest of the year using red, orange and sunrise glass to create the beauty. Choose you base configuration below. Many contemporary homes are going with the simple and monochromatic decor and this black and white color combination fits in perfectly. That kitchen with the black accents and the stainless appliances with this combination on the counter can be amazing. Black and white uses oreo, white and black glass flowers. Spring colors blossom beautifully in this piece with the bright banana, lime, sunrise, orange and red. Want something that will make you smile each time you walk into the room? Spring colors do it everytime. Pick you base configuration below. You can probably imagine Bourbon color combo blending in perfectly with you dining room decor. It was colorized after so many of the traditional color themes and pulls just enough of the warm colors to give it a feel that is perfect fit for your dining room table. Bourbon combines caramel, butterscotch, plum, olive and steel all with the butterscotch and caramel centers. Pick you base configuration below to get started. Barrington is a very string rich look with its emphasis on the reds. Butterscotch is mixed in using both the transparent butterscotch and the more opaque caramel cream glass flowers. This piece is an attention grabber. Choose you base configuration below. Chicago combo highlights the warm earth tones with a mix of the deep rich red using caramel, butterscotch and red glass flowers to bring together a combination sure to match perfectly in traditional decor. Choose your base configuration below for your Chicago design. Sonoran desert in Southern Arizona where the artists live is the inspiration for this piece titled Sonoran. Warm desert colors with butterscotch and caramel centers including wine swirl, butterscotch and caramel make up this inviting color combination. Please choose your base configuration below. 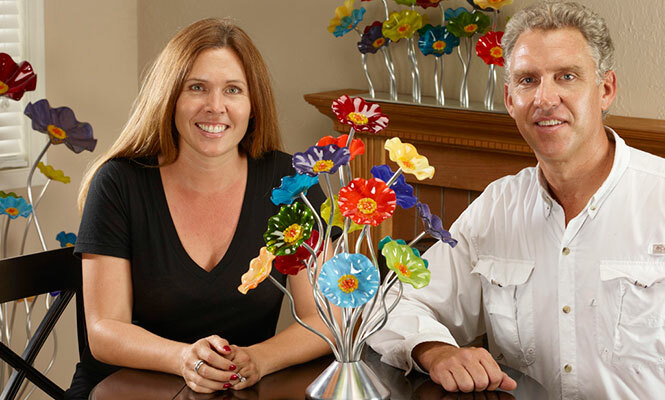 Traditional warm colors and a perfect blend of caramel, orange, sunrise and red have made Tuscany a long time favorite with collectors of Scott & Shawns glass flowers. Be sure to select the base configuration which will go best with your Tuscany color combination. Inspired by the beautiful city in the Colorado Rocky Mountains this piece touches combines natural warm tones in the perfect combination, which is why its been one of the top sellers over the years. Colors included are red, butterscotch, olive and caramel swirl. Choose you base configuration. Oak is a brilliant blend of butterscotch, caramel and white glass flowers to create this beautiful and simple color combination. Naples is in a class of its own using white, salmon, smoke and seashell glass flowers this combination comes to life. This was the biggest seller at one of are exclusive art shows in the town of Naples FL so we thought it fitting to name the combination after the beautiful city by the ocean. Choose your base configuration below. Lincolnshire has always been a top seller when traveling and setting up in fine art shows. This one is just breathtaking and feels perfect with its blend of white, salmon, somke and salmon swirl. Choose your base configuration below. Silverthorn combines the classic caramel and butterscotch with a touch of olive glass with a very pleasing result. Not for everyone but if your house has the right tones this piece will be a knockout. Choose your base configuration below. Cool ocean colors combine to make this a beautiful display of art glass. Turquoise, blue and aqua glass flowers make up this piece. Like a field of poppy's this piece seems to live. Bright white, banana, sunrise and orange make up the poppy color combination. Choose you base configuration below. 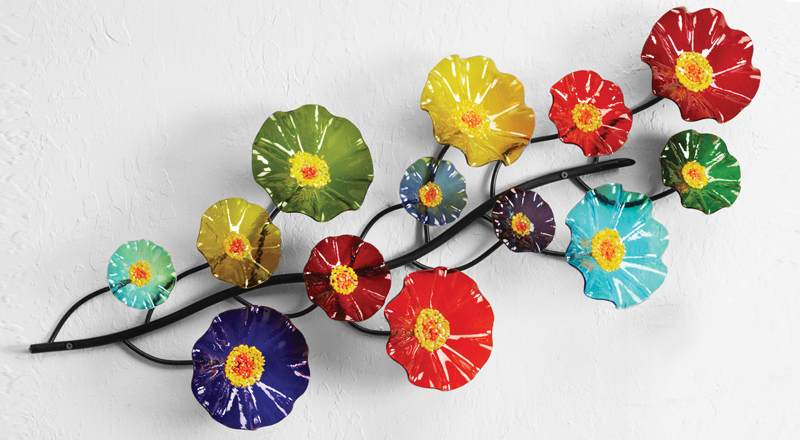 Picasso beautifully combines yellow, moss, orange, caramel and red glass flowers to create a mixture of warm and bright colors in a way that pops out just enough color to a decor without being overstated. Below you can pick your base configuration to get started building your Picasso art piece. Maddie is vibrant, happy and full of energy. This is a combo that will make anyone smile with the combo of lime, white, sunrise and pink you cant go wrong, so pick your base configuration below and get your own Maddie glass flower bouquet. Sedona reminds us of the beautiful city just a few miles from the studio in which the colors of the earth give radiate with inviting warmth and beauty. This piece features transparent chocolate, caramel, transparent orange and butterscotch. You can choose below from any of the many different base configurations to display your Sedona color combination. Island is an interesting and successful mix of transparent glass, clouded glass and warm tones mixed with bright using yellow, moss, transparent orange and caramel to create a piece that really sets the mood of any room. Choose your base configuration below to get your custom Island sculpture. Kaleidoscope combines red, purple, sunrise and moss creating a very strong color combination. A long time favorite of collectors Kaleidoscope will make a strong statement in any room of your home. Below you can select the base configuration you think will work best. This cool mix of colors, aqua, teal, and blue blend so well with many of the beach interiors of so many of our Florida collectors that we had to call this one Ocean. Be sure to pick the base configuration best suited for your space then select the base color below. Flame color combination features Sunrise, Red and Orange handmade glass flowers in a vibrant display. Choose your base configuration and base color then add to cart. Cool vibrant tones make up this piece named after the feeling it gives. Tropical color configuration features Lime, Blue and Teal glass flowers. Choose the configuration below which best suits your living space to enjoy these soothing tones in your home. This is how you make someone smile! Give them a piece with the sunburst flowers and you are sure to bring a little daily joy into someone specials life. Sunburst uses banana, orange and sunrise glass in the happy combination. Navy, butterscotch and caramel glass flowers combined to create a beautiful display of warms contrasted nicely with the dark blue. Pearl is a combination of white, caramel cream, plum and seashell. Dusk is the combination of caramel cream, butterscotch, navy, white and plum. Pillar combines smoke, plum, seashell in a dramatic effect. Red has been by far the best selling color over the years and we give it all to you in this strong and captivating color combination. The combination of navy, seashell and plum make this combo stand out and catch the eye. Simple and beautiful Stark combines plum and white with amazing results. Pick your base configuration below. Midway colors combine white, navy, plum and olive in this unique and beautiful cobmination. Christmas colors are a great option for the holiday season with white and red glass flowers. Use this combination to interchange with your other combinations for the holiday season. Holiday is a beautiful for year around or as a display just for the holidays. Many of our collectors will choose this color combination as an option to put on their piece for the holiday season. Durango combines seashell, butterscotch and plum in a pleasant mix of inspiring colors. Carefree brings together caramel, butterscotch and plum in a lovely blend of warm and cool tones. Take caramel swirl and butterscotch which are the base colors of so many of these beautiful combinations and just sprinkle in some snickers glass and you have this magnificent combo we call Frisco named after the small town in the Colorado Rockies where we spend so many summers doing exclusive art shows. Aspen combines sage, butterscotch and plum glass flowers in a very surprisingly beautiful way. Enjoy this combo on any of our many base configurations. The name says it all on this one... Winter is as simple as it gets yet stunning. All glass flowers are white with butterscotch and caramel centers. Choose you base configuration below. Venice is a beautiful combination using the colors plum, sugar plum swirl, smoke, caramel cream and sugar plum. Portland uses caramel cream, seashell, sugar plum swirl and plum glass flowers to create this mixture of warm and cool tones. Jerome combines salmon, butterscotch, white and salmon swirl all with butterscotch and caramel centers to create this incredibly soft warm combination that will bring magic to the room with the right compliment of colors. Eureka successfully combines caramel cream, seashell, navy white cloud and plum glass flowers to bring to life a combination which is warm with a touch of cool. Match you taste and decor perfectly with this beautiful color combination. Blue smoke combines Oreo, black and blue glass flowers with black and white centers. Pink smoke has been the highlight of many a teens or young adults room. This color combination has long been a favorite for dads looking for something different and special for their daughters. Choose the base configuration below. Black and white with a touch of red is a strong statement and will bring to life the room with just the right blend of these colors. Black Cherry uses black, red and oreo glass with black and white centers to create this masterpiece. Choose you base configuration below.